GEORGE WYTHE was born in 1726 near Yorktown, Virginia. His father was a wealthy plantation owner and he grew up in luxury and comfort. When he reached the proper age he was placed in school but the knowledge that he obtained was very limited and superficial. Fortunately for young Wythe, his mother possessed unusual intelligence and she supplemented his early education. By her assistance, the powers of his mind, which were originally strong and active, rapidly unfolded. He became well versed in the Latin and Greek languages, and made commendable achievements in several of the sciences. The uncontrolled possession of a large fortune caused young Wythe to indulge in the extravagant amusements and pleasures that his wealth made easily obtainable. Losing his parents at such a rebellious age, he was deprived of their example and guidance and his literary pursuits were almost entirely neglected. 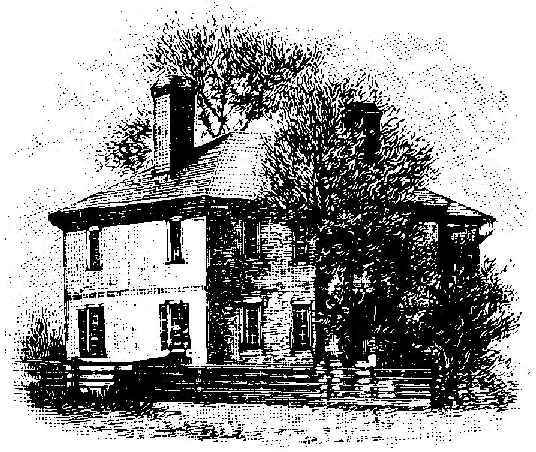 In 1748, upon the death of his wife, the former Ann Lewis to whom he was married for about a year, Wythe moved to Williamsburg where, at the age of twenty-six, he became a member of the Virginia House of Burgesses. At the age of thirty, the principles that had been instilled into his mind by his parents asserted power over his indulgences and he reformed himself. He abandoned his youthful follies and applied himself with unrelenting diligence to his studies. Wythe studied law under John Lewis, an eminent lawyer and quickly rose to the fore front of the Virginia bar. In 1755, he married Elizabeth Taliaferro, whose father had built a dignified house on the Palace Green that they occupied for many years before it became legally theirs at his death. He continued to expand his flourishing law practice and was already a leader in the Virginia bar when Thomas Jefferson came to Williamsburg to study law under his tutorage. Wythe continued to exert all his influence in favor of the independence of the colonies. He loathed the Stamp Act is credited with writing "Resolutions of Remonstrance" which was the strongest protest sanctioned by the Virginia legislature. In 1775, he was elected to the Virginia provincial congress and in August, was appointed a delegate of the Continental congress. He openly supported Richard Henry Lee's fight for independence and he signed the Declaration of Independence on August 27, 1776. In 1777, Wythe was elected speaker of the House of Delegates, and during the same year was appointed judge of the high court of chancery of Virginia. On the reorganization of the court, he was appointed sole chancellor, a station that he filled, with great ability, for more than twenty years. During the Revolution Wythe's wealth suffered greatly. His devotion to public service left him little opportunity to attend to his private affairs. Due to the dishonesty of his superintendent, he lost most of his slaves who were placed in the hands of the British. But by cost-cutting and careful management Wythe was able to payoff his debts and preserve his financial independence by combining what was left of his estate with his salary as chancellor. In 1779, he accepted the professorship of law in the College of William and Mary. Wythe thus became the first professor of law in an American institution of higher learning. He held this position until 1790, and in later years when his judicial duties caused him to reside in Richmond, he had a law school there. Of his eminent law students, Jefferson worked with him longest, John Marshall and Henry Clay studied with him briefly. Late in his life, Wythe freed all his slaves and provided them a means of support until they were able to support themselves. In his eighty-first year, while still fulfilling his duties as chancellor and full of vitality, he was poisoned. The death of this learned, liberal and respected man was believed to have been caused by his grandnephew, George Wythe Sweeny, the chief beneficiary of his will. Wythe apparently drank some coffee that had been laced with arsenic. Although Sweeny was tried for his crime, he was acquitted. Wythe died on June 8, 1806 in Richmond, Virginia, leaving all of his books to his friend, President Jefferson. WYTHE, George, signer of the Declaration of Independence, born in Elizabeth City County, Va., in 1726; died in Richmond, Va., 8 June, 1806. His father was a wealthy planter, and his mother, who possessed unusual intelligence and learning, gave him his early education. Under her tuition he became an accomplished Latin and Greek scholar, an excellent mathematician acquired a liberal	knowledge of the sciences, and was further instructed at William and Mary; but the death of both parents	before he attained his majority and the consequent uncontrolled	possession of a large fortune led him into extravagance and dissipation. He reformed when he was about thirty years old, studied law under John Lewis, an eminent practitioner, and quickly rose to the front rank at the	Virginia bar. Early in life he was chosen to the House of Burgesses, where he was recognized as	one of the leaders, and he continued to serve until the beginning of the Revolution. On 14 November, 1764, he was appointed a member of its committee to prepare and report a petition to the king,	a memorial to the house of lords, and a remonstrance to the house of commons on the proposed	stamp-act. He drew up the last-named paper, but	it so far exceeded the demands of his colleagues	in boldness and truth that it was viewed as bordering on treason, and accepted only after much, notification. From that time he continued to exert all his influence in favor of the independence of the colonies, and in August, 1775, he was appointed a delegate to the Continental congress from Virginia, signing the Declaration of Independence	on 4 July of the year. On 5 Nov., 1776, he was appointed by the legislature, with Thomas Jefferson, Edmund Pendleton, George Mason, and Thomas Ludwell Lee, on a committee to revise the state laws of British and colonial enactment, and to prepare bills for re-enacting them with such alterations as were required under the new government. Mason and Lee did not serve, but so industrious were the other three members of the committee that on 18 June, 1779, they had prepared 126 bills, which they reported to the assembly. He became Speaker of the House of Delegates in 1777, the same year was chosen one of the three judges of the chancery court of Virginia, and, on the reorganization of the court of equity, was constituted sole chancellor, which post he held for more than twenty years. Before the close of the Revolution, debts had been incurred between American and British merchants, and the recovery of these was the subject of the 6th article of John. Jay's treaty with Great Britain, but popular feeling was strong against legal decrees in favor of British claimants. Chancellor Wythe was the first judge in the United States that decided the claims to be recoverable. He lost almost all his property during the Revolution, but he supplemented his small income as chancellor, which was £300 a year, by accepting the professorship of law in William and Mary. which he held in 1779-'89. In the latter year his arduous duties compelled his resignation, and he removed to Richmond, Va. In December, 1786. he was chosen a member of the convention that framed the constitution of the United States, and he regularly attended its sessions, but, being absent on the last day, failed to sign the constitution, he was subsequently twice a residential elector. In the latter part of his life he emancipated his slaves, furnishing them with means of support until they learned to take care of themselves. In the eighty-first year of his age, while he was still in the full vigor of his intellect and the exercise of the duties of the chancellorship, he was poisoned. His nephew, George Wythe Sweeny, was tried for the crime, but was acquitted. 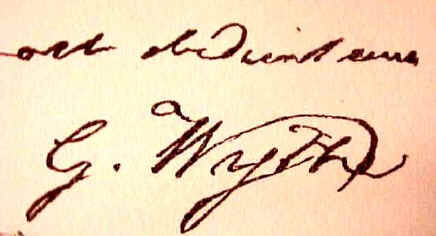 William and Mary gave Judge Wythe the degree of LL.D. in 1790. He was twice married, but his only child died in infancy. Among his pupils were two presidents of the United States, a chief justice, and others who attained high rank in the legal profession. Thomas Jefferson, his law pupil and devoted adherent, said of him in notes that he made in 1820 for a biography of Wythe, which he never completed: "No man ever left behind him a character more venerated than George Wythe. His virtue was of the purest kind, his integrity inflexible, his justice exact. He might truly be called the Cato of his country, without the avarice of the Roman, for a more disinterested person never lived. He was of middle size, his face manly, comely, and engaging. Such was George Wythe, the honor of his own and the model of future times." Statesman Scheduled Events. For more information email: info@gwc.edu. (13840 bytes) berlioznine@msn.com. Enter GWHSOTA Here. them. Get Netscape Communicator FREE at www.netscape.com. 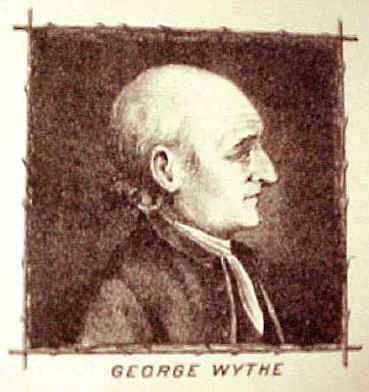 George Wythe. Portrait Sculpture Bust. Original Sculpture Done in Houdon's Style. ... George Wythe. b. 1726. d. June 8, 1806. Signer of The Declaration of Independence. ... My Genealogy Database. Name, George Wythe. Occupation, Sergeant at Law. Parents. ... Children. George Wythe House. Home to George Wythe, one of colonial America’s first lawyers. Start your search on George Wythe.